Big data analytics has been touted to be the next significant thing to transform the medical sector, subject to which healthcare analytics market share will witness a rather noticeable upsurge in the years ahead. The rising popularity of analytics has led numerous healthcare organizations in the world adopting the latest technologies such as artificial intelligence (AI) and the Internet of Things (IoT) to provide value-based care and real time data monitoring. The growth of healthcare analytics industry can also be credited to the high demand from hospitals and clinics to record, maintain, and take decisions pertaining to the collection of a huge amount of patient and physician information. Healthcare spending has risen exponentially in the last few years, owing to the wide range of medication and drugs available, the prevalence of numerous disorders among all age groups, and prolonged hospital stays. The deployment of data analytics however, will help decide if patients genuinely require staying back in the hospital or if the treatment can be administered via prescribed medication alone. In this regard, healthcare analytics industry is finding a huge scope in reducing the overall healthcare costs as it substantially eliminates unnecessarily long stays in the hospitals. Analytics also help physicians unearth patient data, eliminate the need for unnecessary medical tests, and help identify the inefficiencies in the existing treatment delivery methodologies. The significant benefits of big data analytics are expected to stimulate healthcare analytics industry, which is reportedly slated to cross a revenue of USD 16 billion by 2024, with a CAGR estimation of 12% over 2017-2024. Healthcare analytics industry is characterized by innovative product developments and mergers & acquisitions. The Truven Health Analytics acquisition by IBM, worth USD 2.6 billion, is one of most strategic collaborations of healthcare analytics industry. Reportedly, this acquisition that took place in 2016 will help IBM expand its Watson Health unit launched in 2015. In addition, IBM’s cloud infrastructure will hold one of the largest and most distinguishable portfolio of health-related information across the globe, thereby strengthening its position in global healthcare analytics market. Another recent collaboration is that of Change Healthcare and McKesson Corporation, which have merged to form a new alliance that will deploy advanced analytics tools to achieve the best healthcare outcomes for patients and physicians alike. In addition, it is slated to provide innovative solutions for consumers, insurance providers, and medical care experts, thus propelling healthcare analytics industry trends. A highly efficient database management system incorporated with analytics tools will help physicians get an idea of what kind of treatment they need to provide to specific patients and what decisions they need to take on an urgent basis pertaining to the patient’s health condition. Analytics tools help amalgamate all the data onto a single platform. In effect, a patient’s medical tests, prescribed drugs, treatment methods, doctors referred, and lab reports can be embedded on to a single dashboard, which will help medical care providers make highly effective, suitable, and spontaneous decisions for their patients, which will provide an impetus to healthcare analytics market over the years to come. Even within a single hospital, it has been found that medical departments like cardiology, neurology, endocrinology, etc., have no inter-communication, owing to which patients suffering from multiple disorders may not receive the most optimum treatment. Analytics help integrate the different specialties in one common database so that doctors can take quick decisions regarding a patient vulnerable to more than one ailment, thus propelling healthcare analytics industry. Healthcare analytics will help medical care providers get an idea about the patient’s cost concerns. For instance, if a patient, at any given time, walks into the emergency room, the deployment of analytics will help the provider assess the patient’s medical condition and decide if a hospital stay in necessary or the patient can do fine with prescribed drugs. This avoids unnecessary hospital visits and expenses, thereby stimulating healthcare analytics market. Predictive analytics also helps medical care providers predict insurance costs. Companies can work in tandem with insurance providers and come up with an integrated database to create advanced business models and health plans. This will help healthcare providers choose the insurance company that helps them achieve the most optimum patient outcomes. Analytics also reduce administrative and other costs by helping to treat a specific patient pool. The increasing deployment of big data analytics by hospitals and clinics to increase organizational efficiency and save on costs will propel healthcare analytics industry. The behemoth of patient data will help medical care providers treat them better, owing to the fact that they are completely informed about the patient’s medical history. The data of patients, physicians, and payers can be conveniently integrated and shared to provide new patient-level insights. 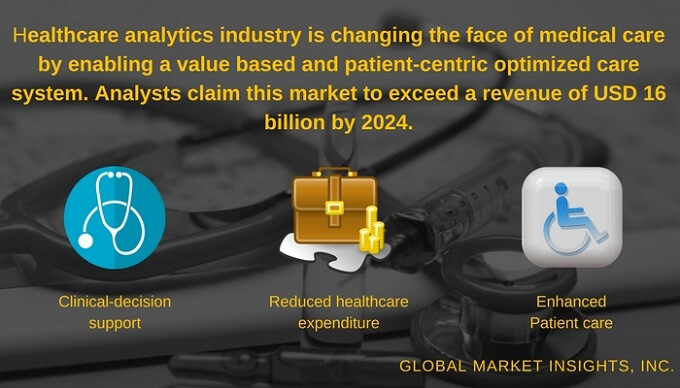 Healthcare analytics industry share from predictive analytics tools is anticipated to cross USD 5 billion by 2024, subject to its widespread application to generate high-grade healthcare solutions. The growth of healthcare predictive analytics market will also lead patients to experience the benefit of better outcomes, thereby stimulating the product demand. Descriptive analytics tools can also help patients alter their lifestyle choices as per their ailments and treatment methods, thereby driving healthcare analytics industry. Commonly shared access to patient and physician data is also likely to cut down on fraudulent practices and prevent the loss of money and information. Insights regarding what the doctors are doing for their patients can be unearthed, thereby curbing abuse and fraud. In addition, analytics help track incorrect or delayed payments, bills, reimbursements, and the like, which will augment healthcare analytics market. Healthcare analytics industry has successfully established its footprints in various geographies across the globe, in countries such as the U.S., Germany, UK, China, Russia, Japan, and Mexico. One of the major healthcare analytics market revenue contributors is undeniably the United States. This is evident from the statistics as depicted in a leading healthcare analytics industry report by Global Market Insights, Inc. As per the report, U.S. dominated North America healthcare analytics market by accounting for more than 90% of the regional revenue in 2016. The country is home to several healthcare analytics industry players, namely Athenahealth, Change Healthcare, Tenet Healthcare Corporation, OptumHealth, IBM, Inovalon, Allscripts Healthcare Solutions, McKesson Corporation, Evolent Health, Computer Programs and Systems, Health Catalyst, Cerner Corporation, and Influence Health. The presence of these giants is expected to stimulate healthcare analytics industry share in the region. Additionally, the rising venture capital funding and a well-established medical infrastructure will also drive the regional industry. The importance of predictive analytics in healthcare has been identified universally and efforts are being made to enable better patient outcomes via data analytics. Recognizing the ways in which data analytics could modify healthcare, companies are involved in heavy research activities to introduce new and advanced technologies to stimulate healthcare analytics industry. The extensive adoption of electronic health records and growing public awareness regarding personalized medication are a couple of other vital factors that are anticipated to drive the growth of global healthcare analytics market in the years to come. Global Market Insights, Inc. has a report titled “Healthcare Analytics Market Size By Product (Descriptive Analytics, Predictive Analytics, Prescriptive Analytics), By Application (Operations Management, Financial Management, Population Health Management, Clinical Management), By End-Use (Hospitals, Clinics, Physicians, Others), Industry Analysis Report, Regional Outlook (U.S., Canada, Germany, UK, France, Italy, Spain, Russia, China, India, Japan, Australia, Brazil, Mexico, South Africa, Saudi Arabia), Growth Potential, Price Trends, Competitive Market Share & Forecast, 2017 – 2024” available at https://www.gminsights.com/industry-analysis/healthcare-analytics-market .